Good afternoon! How are you on this lovely Wednesday? Personally, I’m pretty sure I’m about to choke somebody. I don’t know who yet, but it’ll be the next person who says something about how gorgeous the weather is outside. It isn’t raining, and it’s actually been pretty sunny for most of the day, and if you’ve never been to Pittsburgh then you probably don’t realize how rare that is — especially in the springtime. In general, though, we have one of the lowest average numbers of sunny days in the whole United States. Even fewer than Seattle — although we don’t get as much rain, if you factor in cloudy or partly cloudy days and overcast days, we average fewer sunny days per year. True story; you can Google it if you don’t believe me. So anyway, on the rare occasions that the sun is actually shining and there’s no precipitation around, all these idiots walk around prattling on about what a beautiful day it is, until you feel like you’re going to vomit. Being shut inside a windowless office all day is kind of a double-edged sword, too. On one hand, you don’t have to be subjected to the stupid sun, but on the other hand, all the people around you feel some sense of obligation to give you the goddamn weather report at least once an hour. Unfortunately, I don’t have an office door. I think there’s an official policy somewhere that dictates who exactly can qualify for an office with a door, and I’m definitely not there yet. In fact, the people one or two levels above me on the organization chart also don’t have doors, and I have no idea how much time and hard work it will take to rise three whole levels on that chart. I suspect it doesn’t involve spending half of one’s day writing a metal blog, though. So for now, I have to make do with the invisible, virtual door provided by loud music through a pair of headphones. It makes the days pass by more quickly, and sends a clear signal that I don’t want to be disturbed by any passers-by. On a day like today, though, it takes a little bit extra to be able to block out the outside world — some music that’s especially miserable and filthy and nasty. If you’ve been paying attention to Facebook today, you might have noticed that I spent part of the day with Vulture. That helped for a while, and then since I was already in a dirty, sludgey, agonizing kind of mood, I’ve moved on to Coffinworm. Although it might feel like this band has been around forever, based on the amount of underground cred they seem to have accumulated, they’ve really only been around for a couple of years — their debut full-length When All Became None was just released by Profound Lore about two years ago, while the three-track demo Great Bringer of Night had been self-released about one year earlier. While that demo had been made available for an extremely limited run of physical copies, those have been pretty hard to come by for a long time now. Well, all that’s about to change, because The Flenser has been kind enough to repackage the songs, along with the demo versions of two additional tracks from around the same time, got all five remastered by James Plotkin, and stuck them on some vinyl inside the warm and inviting cover whose artwork (by Bryan Proteau) you can see at the top of this page. I gotta be honest here, even just staring at this cover — in its black and white creepiness — is improving my mood already. 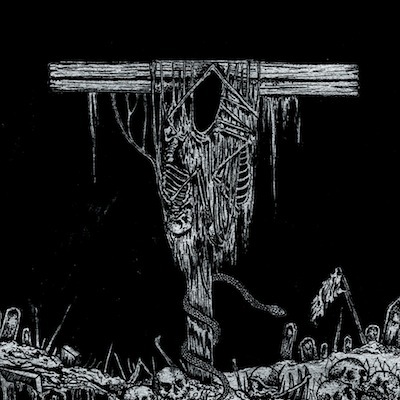 Although the band’s name might hint at images of rotting, decaying, putrefying flesh (at least that’s what it makes me think of), the art shown here is a much more faithful depiction of their sound. Here we have piles of bones, looking rather filthy, probably coated in layers of ancient dust from being shut inside a sepulchre for untold numbers of years. These songs are just as black and ugly as the cover that adorns them, probably even more so. Over the course of the album — and in fact, within each of the songs (which tend to range between about seven and nine minutes in length) — the listener is subjected to plenty of drawn-out moments of the slowest, most dismal sounds imaginable. These feature anguished, blood-curdling vocals, and guitar tones that are beyond distorted — rather, they might have been produced using old, rusty cables plugged into effect pedals with nearly-dead batteries which have leaked acid and corroded all of the electrical components inside. Furthermore, during a couple of the quieter, more melancholic sections, it seems like the guitar strings are (intentionally and sadistically) just slightly out-of-tune; not enough to result in wrong notes, but just enough to twist the listener’s psyche in painful knots. And on the other hand — as I said, over the course of the album as well as within each of the songs — they also sometimes turn up the intensity and the tempo, primarily led by the drums, until we have some sections that are fairly upbeat and might even be called “sludge ‘n roll.” Of course this upbeatness, while serving quite well at providing contrast, does very little to lighten the mood. The vocals here are no less tortured and painful, the guitars no less disgustingly filthy. And why should they be? As I’m informed yet again, although a slight breeze has begun, it’s still a gorgeous day out there with nary a cloud to be seen. Soon enough I’ll have to venture out in it. And as they so eloquently described in Fight Club sometimes you just want to destroy something beautiful. Coffinworm have provided the ideal soundtrack. * – These four songs were all later re-recorded and included on the band’s full-length When All Became None. This vinyl reissue of Great Bringer of Night is being sold in a heavy jacket with an insert. They’ve pressed a total of 500 copies: 120 in gold, and 380 in coal-tar black. Last time I checked, the stock was getting pretty low for the gold, and a little more than half of the black remained. You know how these things work – once this pressing runs out you can’t be sure they’ll ever be made available again, so don’t miss your chance! Pre-order the album here; all orders are expected to begin shipping sometime next week. This entry was posted in Demos, Free Downloads, Free Stuff, New Releases, Reviews and tagged Bryan Proteau, Coffinworm, Fight Club, Indiana, Indianapolis, James Plotkin, Profound Lore Records, The Flenser Records, USA, Vulture. Bookmark the permalink. Get ’em While They’re Hot: Second New Vesperia Song Now Available for FREE!